On 18 March 2014, between 30 and 40 white-beaked dolphins died near Cape Ray. 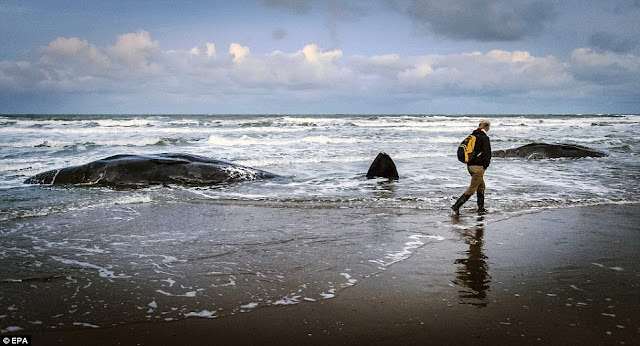 Wayne Ledwell said, “The conditions were pretty severe out there as far as wind, and eventually they succumbed to the stress of being in the situation they were in.” He did not observe the actual stranding but felt that the dolphins probably panicked and drowned. The video below looks to me more like they were slammed hard between large chucks of ice and the rocky coast. I have been in many situations where a strong wind blows surface ice both into and away from shore, depending on the direction of the wind. It is very common for ice to be blown from one side of the Gulf to the other in this area. In my opinion, a strong shoreward wind (25 to 40 knots) blew the non-navigating dolphins into the rocky coastline near Cape Ray. They had no idea which way to swim to get back to deep water. The strong winds then blew in large chucks of ice on top of them.. They were killed or injured by being slammed around between the heavy ice chucks and the rocky shore. Sharks were likely feeding on any dolphins that were not in the really shallow water. The way I see it, the injured white-beaked dolphin pod swam with the flow of the surface currents that run south along the east coast of Greenland. The current swings west as it rounds the southern tip of Greenland. It then flows west to the edge of Newfoundland/Labrador (Labrador Sea) before turning south again. The non-navigating pod would have neared the mouth of the Straits of Belle Isle and may have came within sight of Belle Isle. They were draw into the Straits on an incoming tide into the Gulf of St Lawrence. The surface currents then guided them slowing out of the Gulf through Cabot Strait. The pod was spotted Sunday morning close to an area known locally as Northwest Cove. Shortly afterwards, they were washed ashore near Cape Ray in a near-gale force shoreward wind. They were beaten and bloodied while being knocked into large chucks of Ice.